SUMMARY: It takes money to make money, as the famous idiom states. When it comes to email marketing, a sufficient budget to execute successful campaigns is essential. To help you justify or perhaps decide on that budget, this week we are taking a look at data about email marketing ROI. In looking through the free response portion of our Email Marketing Benchmark Survey, this challenge from a director of marketing caught my eye — "budget stagnation and content creation challenge." It makes sense. Creating content, or at least quality content, even in a nominally "free" channel like email (i.e., no media spend), is far from free. It isn't even cheap. As with anything else you’d like to do well, it takes resources. 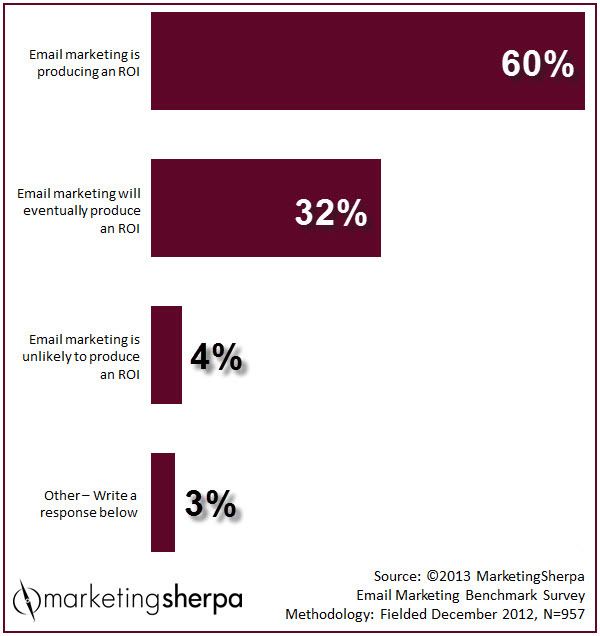 As you can see, an overwhelming majority of marketers see email marketing as an ROI-producing activity, with 60% indicating email marketing is currently producing an ROI, and 32% believing email marketing will eventually produce an ROI. To play devil's advocate for a moment, one could make a fair statement that those who aren't realizing an ROI from email marketing would likely stop the practice and, thus, not engage in our Email Marketing Benchmark Survey. On the flip side, maybe they’d be so adamantly opposed to wasting money on email marketing they would want to share their findings through the survey. Either way, when we broke out the data, we found B2C marketers were even more likely than the unsegmented group of marketers to see an ROI from email, with 70% reporting email marketing is producing an ROI. When we asked marketers what the estimated ROI from email marketing programs for the organization was, the overall group reported a 119% ROI. As we sliced and diced the data, the segment with the largest ROI was organizations sending less than 100,000 emails per month, who reported a 139% ROI. In fact, the only segment that didn’t report an ROI of at least 100% was organizations sending more than 100,000 emails per month. But, the group reported an ROI of 94%. While these numbers are certainly impressive — who wouldn't want to double their money in an economic environment when a 30-year Treasury bond won’t even earn you 4% — I should note that this is a decrease from our previous findings. While making apples to apples comparisons is always difficult due to the variability in survey sampling year over year, in the MarketingSherpa 2011 Email Marketing Benchmark Report, marketers did report a 169% ROI. Hopefully this data helps as we get closer to the end of the year, and you have to set or request your own email marketing budgets. In the past, many marketers have told us MarketingSherpa charts benefit their attempts to secure budget approval. Of course, while industry-wide data can be informative, nothing is more powerful than having a firm understanding of your own ROI. If you haven't already, take a deep dive into the numbers. It's likely not as hard as you think. As one survey respondent replied, "ROI on email marketing is easier to measure/test/optimize. Social media is time-consuming and ROI is difficult to measure." Do you have good results from your email marketing program? Share them by entering MarketingSherpa Email Awards 2014 before September 8, 2013, for the chance to win a trip to Email Summit 2014 at the Aria in Las Vegas to share your case study. Since there's no entry fee, if you win, the ROI would be infinite.